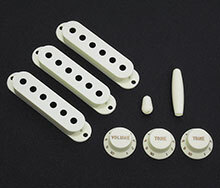 Comparison Information About Fender's Pure Vintage Accessories in Reference to Standard or Modern Production Accessories. 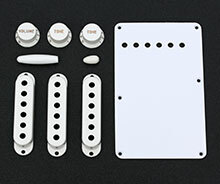 Click Here for a comparison of Fender's accessory colors. 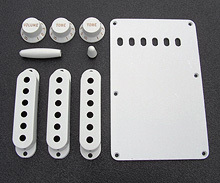 Click Here for a comparison of Fender's modern knobs vs. Fender's Pure Vintage '50s & '60s knobs. 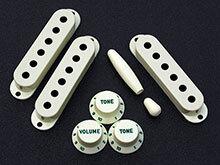 Click Here for a comparison of Fender's modern knobs vs. Fender's Pure Vintage 1954 knobs. 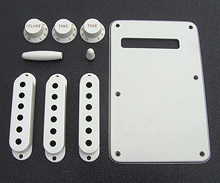 Fender's new Pure Vintage "Eggshell" color is basically white, just barely perceptible less white than their standard white. The new Pure Vintage "Vintage White" color is a light yellowish/mint-green color. The skirt on the Pure Vintage knobs is slightly different than the standard knobs. The Pure Vintage skirt slants at a 46 degree angle where the standard knobs skirt slants at a slightly lesser (or flatter) 49 degree angle. The Pure Vintage knobs also have smaller numbering. The switch tips are slightly less tapered towards the top with a single slot for sliding onto the selector switch. 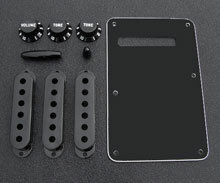 Tremolo arm tips and pickup covers are the same shape as standard production. 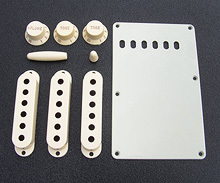 Fender's new Pure Vintage 1954 "White" accessory kits are not quite as white as their standard white knob sets but not as off white as parchment, sort of in-between, you can see the comparison of the colors in the above link as well as the difference in the knob shapes.